Source: Gonzales Research & Media Services. COUMBIA, Md. 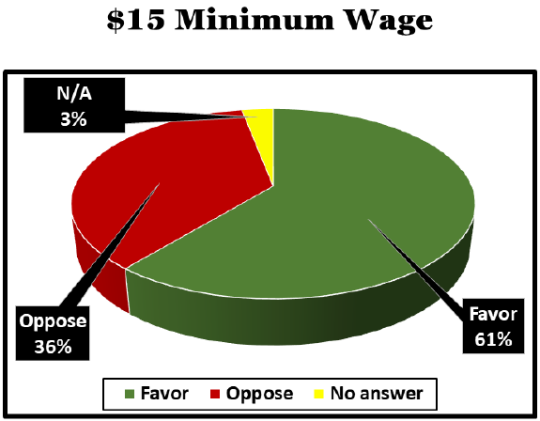 (January 10, 2019)—In one of the top issues facing legislators in Annapolis this session, 61% of Maryland voters favor raising the minimum wage to $15 an hour, and almost half (47%) strongly favor the idea, according to a new poll for MarylandReporter.com by Gonzales Research & Media Services. The move is broadly favored by more than three-fourths of Democrats (78%) and eight out of 10 African Americans (81%), as well as a majority of independents (55%). Only among Republican voters, a minority of the Maryland electorate, is their broad opposition to it, with almost half (49%) strongly opposed to the hourly hike. The survey on the minimum wage (full results here) was taken as part of larger Gonzales poll of 809 voters statewide released Tuesday with a margin of error of plus or minus 3.5%. The question was chosen because it is likely to be a major issue to be debated this session. "We're going to pass that ($15 minimum)," Del. 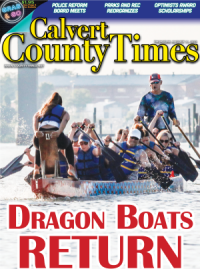 Dereck Davis, chairman of the House Economic Matters Committee, told MarylandReporter.com Wednesday. He said the measure would have passed last year except for opposition in the Senate. House Speaker Michael Busch has indicated he favors the increase, and it has the enthusiastic support of the Legislative Black Caucus and organized labor. "We totally support it—100 percent," Donna Edwards, President of the Maryland State and D.C. AFL-CIO, told MarylandReporter.com. Senate President Mike Miller told an economic development conference Thursday that raising the minimum wage is "very challenging… Already we're higher than other states in the region." "We're going to find the right way to deal with it," Miller said. Maryland raised its minimum wage to $10.10 in July, with increases phased in over several years. Montgomery County has a $12.00 an hour minimum and Prince George's has $11.50, while the District of Columbia is at $13.25. Republican Gov. Larry Hogan raised problems with raising the minimum wage at an event held by The Daily Record Wednesday. 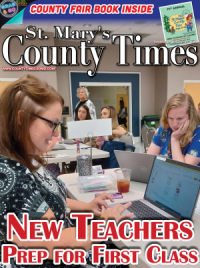 "It sounds really good to say, hey, people should make more money, especially people in their first job, but it's not as simple as that," Hogan said. "We need to have a discussion about that." At $10.10, "We're by far the highest in the region and one of the highest in the country." Pennsylvania and Virginia are both at $7.25, the federal minimum; Delaware is at $8.25 and West Virginia $8.75. By going to $15, Hogan said, "Some reports say we could lose as many as 100,000 jobs." Businesses leaving the state and job loss is why he ran for governor, Hogan said. "We start raising taxes, raising the minimum wage … Do we start returning to that failed economic status again? I don't think people want to reverse course and put the economy back where it was," the governor said. "We have to help people grow out of poverty, but that's different than [increasing] minimum wage." Last year in the Senate, there were four different versions of raising the minimum to $15 introduced, and there is no bill filed yet this year, pointed out Larry Richardson, chief lobbyist for the Maryland Chamber of Commerce. "We've gotta see what the bill says." "We understand why the proponents want to do it," Richardson said. But the chamber and the National Federation of Independent Business oppose increasing the minimum because it increases costs, puts pressure to raise other wages and ultimately costs jobs. This story and the full results of the poll can be used by anyone without permission with attribution to the Maryland Reporter-Gonzales Research January poll.